Police deny allegations of attempt to break into Melaye’s house, vows not to lift siege until the senator is arrested – Royal Times of Nigeria. The Police has denied allegations that it is planning to break into the home of the Senator representing Kogi South Senatorial district, Dino Melaye. Melaye had alleged in a tweet today that the force brought tools to break into and vandalize the house. 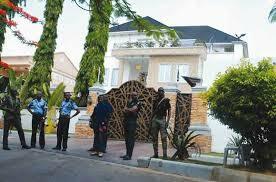 The Police, however, denied the allegations on Wednesday, while also taking journalists around the house as proof. 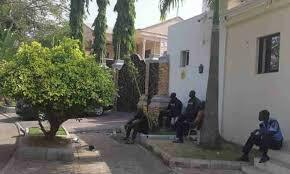 The police also vowed not to leave Melaye’s residence until they arrest him. The Police have subsequently deployed over 50 additional policemen around Melaye’s residence located on 11, Sangha Street, Off Mississippi, Maitama, FCT. Findings indicate that the Police might storm the building and forcefully arrest the lawmaker who had allegedly holed up in the house since last Friday. The police claimed they heard him shout at an officer from a window on the building’s top floor. They, therefore, vowed to remain at the residence until he turns himself in. The Police said Melaye was wanted for the alleged shooting of one Sergeant Danjuma Saliu, while on stop-and-search duty along Aiyetoro Gbede, Mopa Road in Kogi State. The Police stated that Melaye had repeatedly spurned several invitations asking him to report for investigation into the case of attempted culpable homicide.